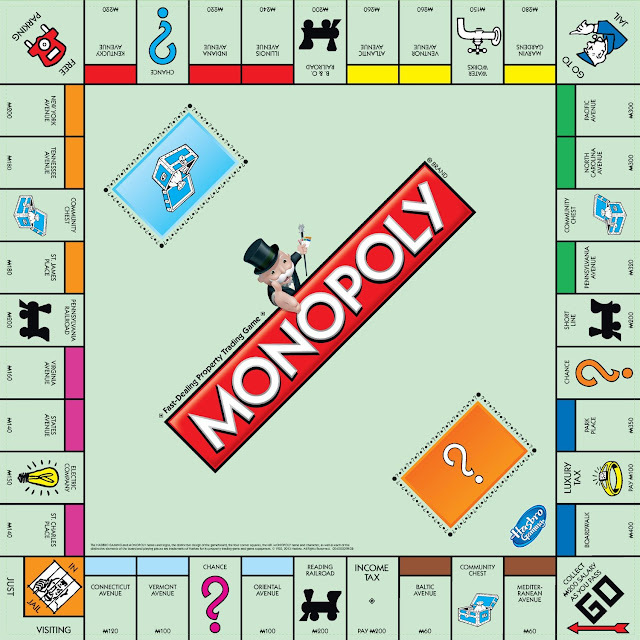 I learned a lot from playing Monopoly as a child, but one major thing I didn't realize is that many games in the real world are played on this board, but with the rules from the Queen of Heart's croquet game in Alice in Wonderland, not the ones that come in the box. Here at The Malibu Post, we thought we might be the only ones who find the entire Measure W debate bewilderingly reminiscent of the White Rabbit's song from Alice in Wonderland. Apparently, we aren't the only ones. The answer is, Whole Foods isn’t on the ballot. 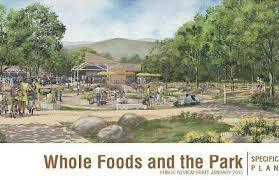 Although the 38,425-square-foot shopping center planned for the 5.88-acre site on the corner of Civic Center Way and Cross Creek Road that is on the ballot as Measure W has been called “Whole Foods in the Park,” and “Whole Foods and the Park,” and it is wonderfully fortuitous for the developer that he was given the letter W for the ballot measure, what the people of Malibu will be voting on in November is neither a Whole Foods nor a park, it’s whether the developer should be allowed zoning variances to build a bigger project. Any development over 20,000 square feet automatically triggers a community vote. Measure R mandates that if a developer wants more than 20,000 square feet, the project must be approved by the people. However, even if Measure R never passed, city code would still have restricted the amount of development to much less than the developer is seeking approval for. The only way this project gets to be 38,425 square feet is through voter-approved variances. The proposed project site totals approximately 256,168 square feet. Development under the Code Complying Alternative would consist of a supermarket (28,879 sf) and 129 parking spaces. Pursuant to the Malibu Municipal Code and the Local Coastal Program, a total of 166,509 sf of landscape area and open space are required to be provided. 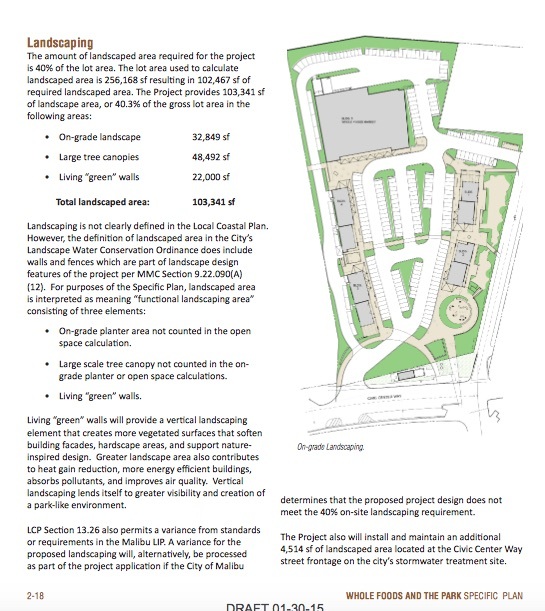 The total landscape area and open space provided under the Code Complying Alternative would be 166,719 sf. Therefore, the Code Complying Alternative would meet the requirement. The development proposal on the ballot this November definitely doesn't meet that requirement. Malibu voters are being asked to give this developer permission build on 70,494 square feet of the property's landscaping requirement—that's almost two acres of extra concrete. Here's an aerial view of the proposed development for scale. The large gray building is comparable in size to the two-story Malibu County Mart building, shown with the red roof in the foreground. The developer is proposing five buildings on the site, with 220 parking spaces. As the "Code-Complying" version of the project described above indicates, the 24,549-square-foot main structure could technically be built under the city's existing land use restrictions, but even that would trigger the Measure R vote requirement for projects in excess of 20,000 square feet. This building is described as a Whole Foods in the developer’s campaign materials, but is not identified as such in the actual ballot measure. Malibu City Attorney Christi Hogin has said on record that if the plans are approved, the developers are free to put anything they wish in the space. It may become a Whole Foods. It may not. Here's the actual ballot measure. It doesn't say Whole Foods, because that's not the point. Measure W is asking if Malibu residents want to approve extra entitlements for a shopping center. It's not asking if we want a Whole Foods, and it certainly doesn't guarantee that the community will get one, if the measure passes. That promise is being made by the developer, a man who is currently suing the city to overturn Measure R.
The developer is also proposing four smaller buildings, each about the size of a family home: 3,015 square feet, 3,086 square feet, 3,592 square feet, and 4,183 square feet. This space, and additional hardscaping, including the parking lot to accommodate the restaurants and shops that will occupy the four extra buildings, is really what we are voting on in November. ...they seem to have somehow forgotten to add the parking lot, the fast food restaurant, the sit-down restaurant, and the shops, so we fixed that for them. Here's what the developer could build on the property without variances. All of those beautiful glossy ads appear to be trying to convince Malibu voters that the project is much smaller than it is. Like this. Here's a more accurate representation of the square footage: the green pieces are the extra four buildings, which will house restaurants and shops. 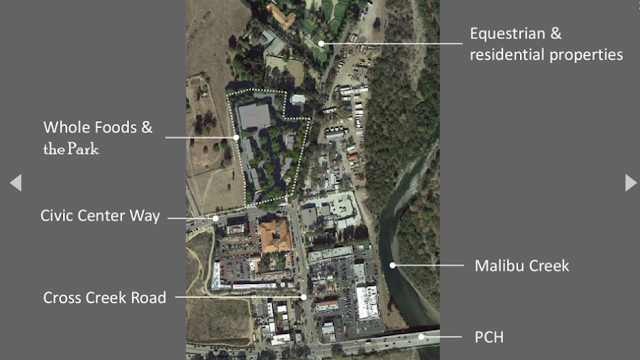 And here's the full build out, with the La Paz shopping center next door, the Santa Monica College satellite campus that will be built next to the library, and the proposed Malibu Bay Company development on the lot currently used for the Chili Cook-Off. 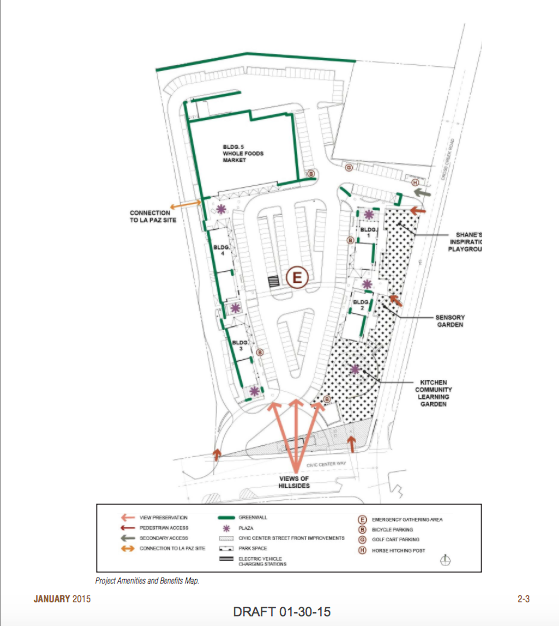 The developer is also offering three small park areas, described in the developer’s proposal as: "Shane’s Inspiration Playground, a fully accessible playground with facilities for children with special needs"; a "Sensory Garden"; and a "Kitchen Community Learning Garden," which will "provide learning opportunities for children and adults interested in growing sustainable organic food, and including school classes." These are lovely ideas, but critics of the project point out that they are a small part of the plan. According to the project's specific plan, the playground is 6200 square feet, the sensory garden is 3000 square feet, and the community garden is 2500 square feet. Here's a visual from the project's specific plan, showing the ratio of buildings and hardscape (driveways and parking areas) to park space. To facilitate all of this extra development, the developer is asking the voters to approve variances that would allow the open space requirements for this property to be greatly reduced. This would permit the developer to substitute walls with plants on them— “vertical” landscaping—for a large portion of the landscaping requirement. Malibu residents are being asked to approve a plan that substitutes walls for open space. The developer is proposing to meet the city's 40 percent landscaping requirement by planting things on the walls of the buildings. A total of 22,000 square feet of the landscaping requirement will be made up of "living green walls." In contrast, the designated "park" portion of the The Park, LLC, comes to just 11,700 square feet. The quote marks around "green" in the infographic, above, seem to denote deliberate sarcasm. One suspects the line about "vertical landscaping lends itself to greater visibility and creation of a parklike environment" does, too. A parklike environment for squirrels, maybe, and snails, definitely, but not for people. At The Malibu Post we like to think of this idea as Escher’s Malibu Garden, since a vertical garden is only practical for residents of one of M. C. Escher’s dimension-defying illustrations. We wrote about that issue at length in an earlier post, available here. Another thing Malibu residents are being asked to approve, to accommodate more development on the site, is a change to the setback requirements: 20 percent on the east: from 63.37 feet, to 50.70 feet; 20 percent in the rear, from 107.55 feet, to 86.04 feet; and almost 40 percent along the front: from 143.4 feet, to 88 feet. Most of that is going to end up being driveways and other hardscaping. Ultimately, the biggest park at “The Park, LLC” is the parking lot, and while it will be landscaped with trees, it doesn’t change the fact that this is a mall—an expensive, high end, nicely landscaped mall, but a mall all the same, and not a park, or even necessarily a Whole Foods. Anyone who thinks there’s a 100 percent chance that Malibu will really end up with a full service Whole Foods market needs to take a look at Silverlake, where promises of a Whole Foods have diminished into a promise of what some are calling a “Half Foods”—Whole Foods smaller, millennial-oriented (whatever that means) new “365” market chain. Journalist Helaine Olen at Slate wrote, “Hell hath no fury like an upscale urbanite who’s been promised a Whole Foods only to see it yanked away,” and she points out the fact that Whole Foods doesn’t care. “The outcry offers lessons in everything from how not to manage public relations (Whole Foods, I’m looking at you) to the promise and perils of marketing to millennials to, finally, what happens when people come to define themselves according to where they shop only to discover that corporate behemoths don’t necessarily reciprocate their love,” Olen wrote. Here's HBO's John Oliver's take on the infamous $6 asparagus water incident. Other critics point to Whole Foods' tanking stock, and the seemingly unending series of scandals ranging from the silly: the infamous $6 asparagus water that was a goldmine for comedians like HBO’s John Oliver, to the serious: overcharging Los Angeles and New York customers for packaged food, and grisly claims by the animal welfare organization PETA in a recent lawsuit alleging that the company’s “humane” meat is a sham. 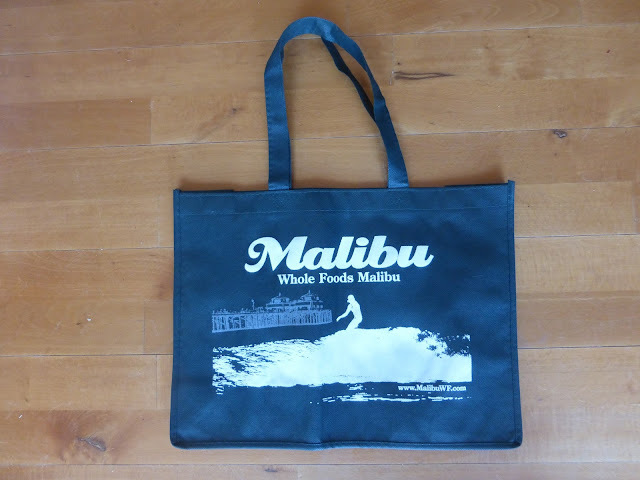 It's interesting that the handy shopping bag some Malibu residents were sent, while kind of a Whole Food-ish green color, doesn’t use the actual color or logo of the grocery chain. One has to ask why not, if the store is a given. The bag is sort of green, but that logo doesn't look anything like the real Whole Foods logo. 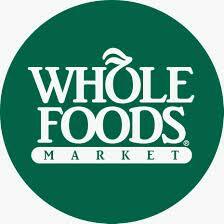 If that bag was really about Whole Foods, wouldn't it look like this? 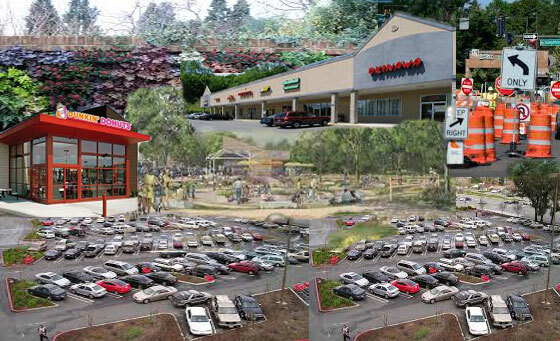 Regardless of whether it is ever home to Whole Foods, will the world end if this shopping center is built? No. But there is no way this project won’t impact traffic, and combined with the behemoth La Paz shopping center already approved next door, these two malls will permanently change the character of the Civic Center area. 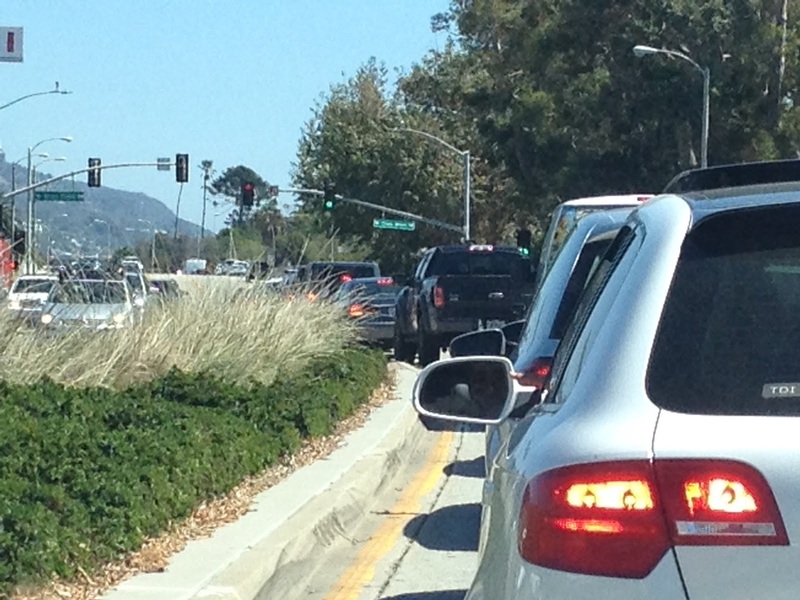 This is weekday afternoon traffic at PCH and Cross Creek Road without the new 38,425-square-foot shopping center. There is no way this development isn't going to have an impact on traffic. Whether that impact is adequately offset by the amenities offered by the developer remains to be seen. La Paz is already approved and will happen regardless of whether the people of Malibu want it or not. This time, thanks to Measure R, Malibu residents have an opportunity to directly weigh in on a portion of the Civic Center’s future. Malibu residents can either approve this project or turn it down and ask the developer to come back with something that requires fewer variances. 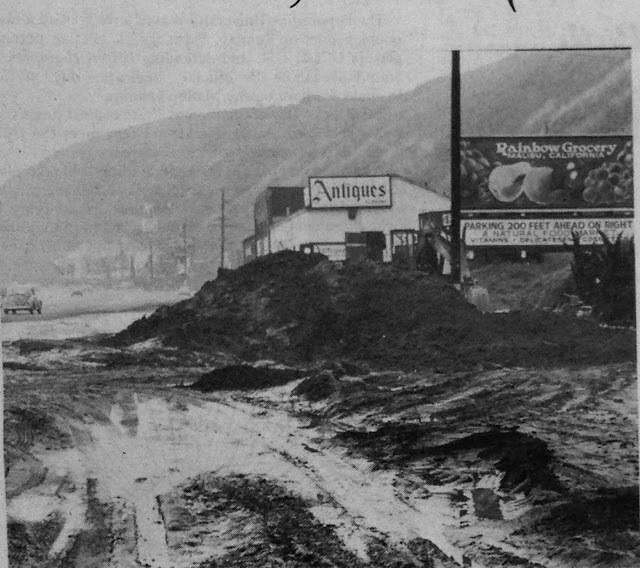 A billboard for the Rainbow Grocery, Malibu's original organic grocery store, rises out of a sea of mud covering Pacific Coast Highway during the El Nino storms of February, 1980. The photo is from a Malibu Surfside News article carefully clipped and saved by my mom. It's a reminder of two Malibu constants: nothing, no matter how loved or iconic, lasts forever; and Mother Nature, not developers or conservationists or anyone in between, ultimately determines the shape of the land and the fate of everything on it. We won’t know until November if the desire for chia seeds outweighs the willingness to forgo urban and suburban conveniences that is a traditional part of Malibu’s character, or if the play park and demonstration garden provide a community benefit that is great enough to make up for the loss of open space and higher building density that the variances for the project grants. It’s a decision Malibu residents will be weighing carefully. Now let's get this out on social media. Great post! You've hit the points that will educate voters, now it's up to readers of your blog like me to share this information and raise awareness. Thank you, Suzanne, you've gifted the community another gem with your talented writing. I only lived in Malibu for 28 years so I have empathy for the folks who grew up there and saw it as it used to be...The rest of this hullabaloo is just different flavors of NIMBY. The simple fact remains there is more demand for the Malibu "experience" then there is supply, and it pushed out most of the regular joes years ago. Any Affordable Housing? Nope. Public Transportation? Barely...Fighting for public beach access...It took the state for that and a few determined activists. Getting up and down PCH on a summer day has been a nightmare for decades. When I got there (1983) I saw kids who were raised in a true rural lifestyle with echos of riding horses on the beach and to the market. Folks lending their beach key to friends to go for a surf. Kids cooking fresh caught fish right on the beach and enjoying the full moon. I am sure that kind of stuff still happens from time to time. and among the few remaining locals the Aloha Spirit remains. 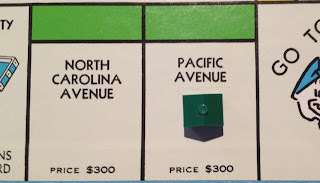 Now though..It's not different than Newport or Laguna...Rehabs and Sober Living domiciles have sucked up most of the affordable(? LMAO) housing Pepperdine the rest. When I paddle out (which is very rarely) I get stink eye from the Nimby "Locals" who lived on the Point for five years as most everyone I know has moved on to greener pastures. Stopping a development or two is meaningless unless it's accompanied by a change in attitude. Talk to the old timers and long term residents. Ask them how to bring back the spirit of the Malibu I only got a small taste of...Hint: It's got nothing to do with buildings...I miss it dearly...but a regular Joe like me has no place there anymore. 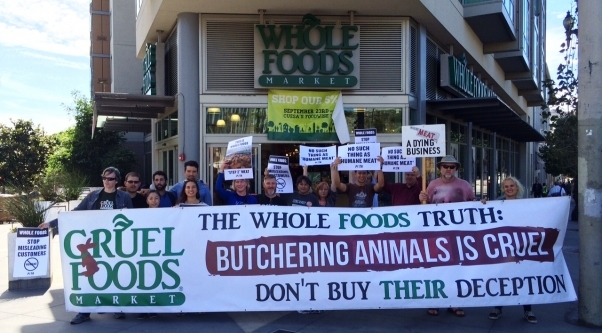 Obfuscating that truth by pointing the finger at Whole Foods right or wrong will not change that. Thank you for your comment, William. The message here on the Malibu Post is that Malibu IS for everyone. Malibu is the only city located completely within the boundaries of the Santa Monica Mountains National Recreation Area, the largest urban national park in the world, and it still contains many things that are beautiful and worth continuing to fight to protect. Many residents are onboard with that message, and most of our elected and appointed officials are committed to environmental issues, even if everyone isn't always on the same side of every issue. Unfortunately there are some ants at the picnic, and some of them are very rude ants and entitled ants, as opposed to the garden variety, but that doesn't mean all of us can't enjoy the picnic and admire the view. 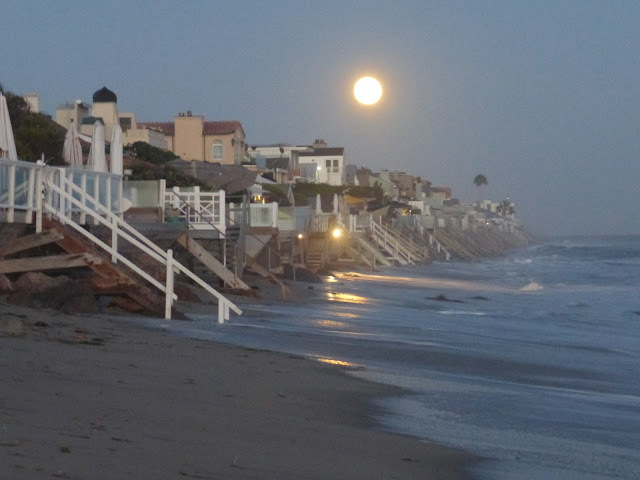 The bottom line is, the beach belongs to the people of California, and everyone has an equal place there. I respectfully disagree with your statement that there is no place in Mlaibu for an ordinary Joe, being an ordinary Josephine, myself. 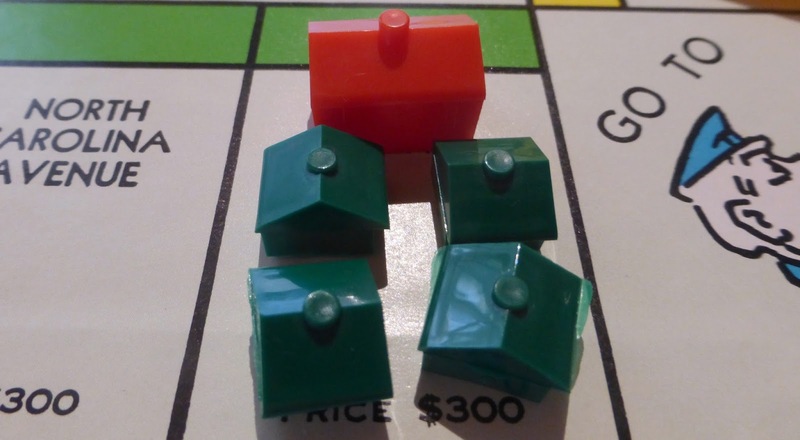 This post isn't about Whole Foods, it's about zoning and land use, and development density. The obfuscation is the developer's effort to cloak the nuts and bolts of the issue behind the Whole Foods name, and it seems to be working remarkably well. That doesn't mean that they are bad people, or that the project will bring about the end of the world, it's just how the game is played. But those are all things that are crucial to conservation and the dialogue on preservation vs development. Thanks to the current generation of Malibu activists, the community has an opportunity to vote on this issue in November, and to me, at least, that really is the spirit of Malibu—people who recognize the beauty and uniqueness of this place and are willing to fight for it. Next time you're surfing out here, keep your eyes on the waves, not the idiots—every village has a few, but they don't have to be our defining characteristic. What exactly are the attributes of Malibu? Is it the easy access to freeways? The vitality and choice of shopping areas? Affordable housing? No on all accounts and not anymore on the last account of affordability.Is it that current residents want to keep everyone else out, of course not, very few private places exist anymore in Malibu. What is it exactly we are debating? In a similar realm of exposure I watched "San Francisco 2.0." last night on PBS. A very similar situation is happening all across our coast, DEVELOP EVERYTHING OUT FOR PROFIT! This is not just a "Malibu" thing it is a microcosm of profit-taking/making allowing a class distinction to run over and on top of common sense. We have no freeway access, shopping distinction, hospital locations etc. What we DO have is a unique coastal treasure of mountains, canyons and beaches unlike no other! 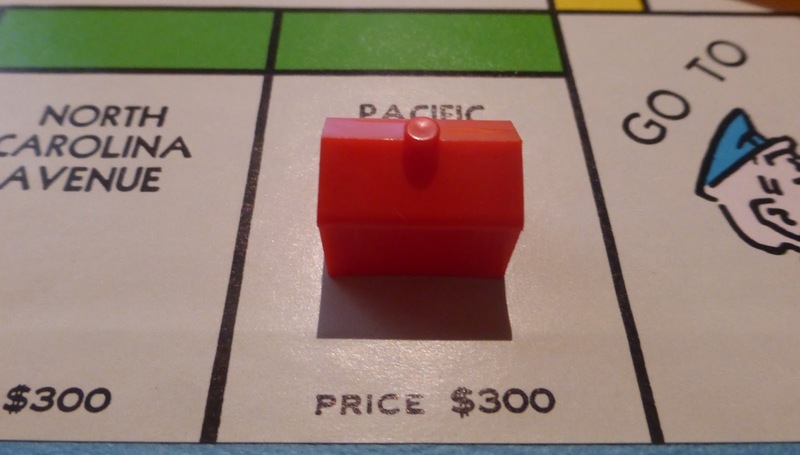 (See Malibu's mission statement) What we have also incurred is the unique housing market where a lot of homes are invested in but not lived in for most of the year. There is quite definitely a difference between the people who actually live here, work, travel, raise kids, pay taxes and contribute to every level of what's going on in Malibu.There seems to be a percentage of people who own homes that do not participate in their cities workings. These homeowners are insulated, self-contained and seem to want nothing to do with what happens next. 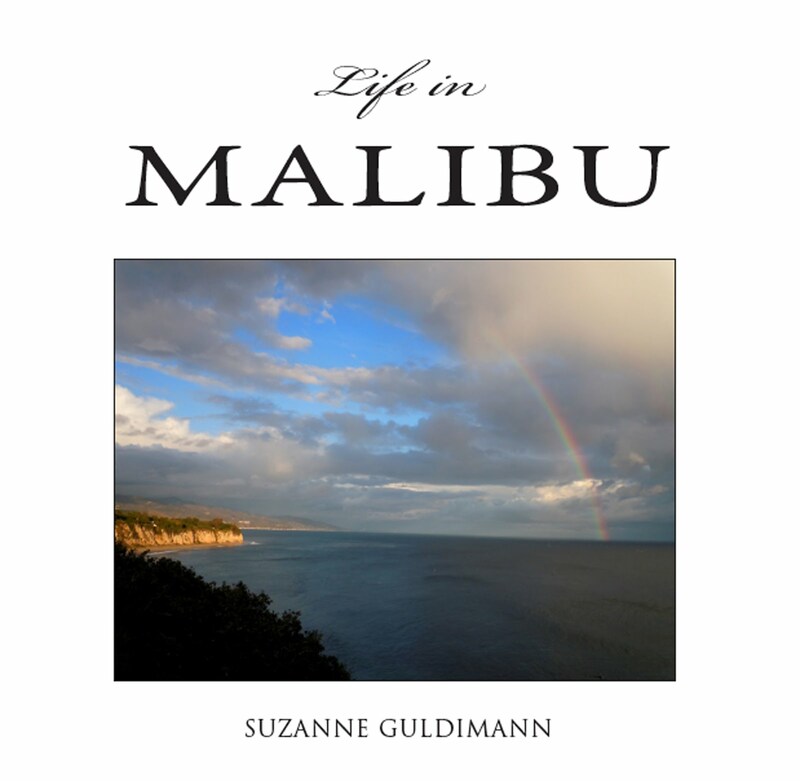 The want for increased street lighting, reduction of dangerous wildlife and the homogenized liquidation of what makes Malibu so valuable. Once it is gone it is truly gone. I urge people to watch "San Francisco 2.0" and see how we are not the only community that is threatened by this. One of our most creative cities in the world is being eaten alive. "Malibu" is a cliche that will be bought and sold, bottled by corporate indifference and sold to the highest bidder. On the other hand Malibu has been unique in a lot of ways, an old California lifestyle, full of wildlife and wildness, subject to awful natural incursions, not tamable by any stretch. We need and want better stewardship for the City, either that or the dissolution of the "City" and all it has done towards the OPPOSITE of their Vision and Mission statements. "We the people, by the people," in order to retain some wilderness in Southern California to form a more perfect union between USE and MISUSE of our most precious resources. Vote no on W. Exercise some sort of conscious effort, do not let some one else direct our future and the generation to come after us. For those who have lived here for decades remember what seems to hold us all together during difficult times, community. Natural disasters here come in one size, extra-large, and we as a community have been through immense times. This time it comes from within our business sense and want of bigger and better? A kind of "under the radar." Pull together now and be the unique location it is and not a destination resort city, nor a shopping location or a trashcan of useless empty storefronts. This reminds me of an episode of SOUTHPARK from a few weeks ago. Go look it up. 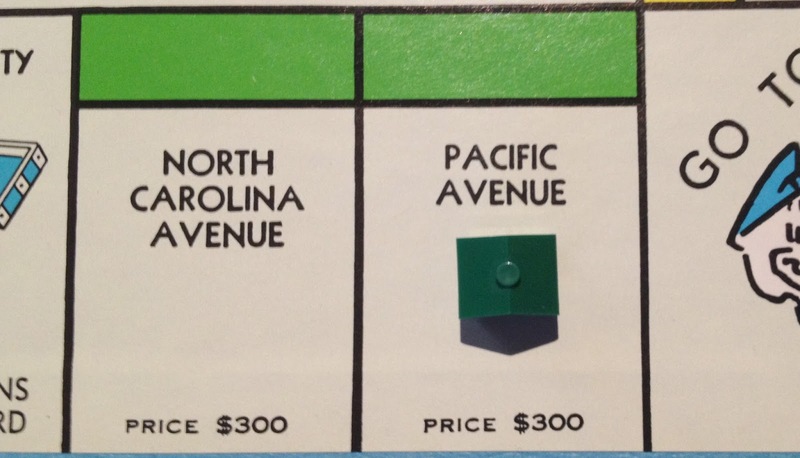 It's the one on gentrifying the old part of South Park with a Whole Foods.